~ Acacia's last words to Froese. Acacia (アカシア Akashia), the Gourmet God (美食神 Bishokushin), is the greatest Gourmet Hunter in history and is renowned and worshiped by the people of the Human World. Throughout his life and career, he discovered countless ingredients all over the world, including the Gourmet Jellyfish from which he discovered the Gourmet Cells, and is the first and only person to find the holy and phantasmal ingredient GOD, taking most of his life to do so and was only able to discover it in his final years. With GOD he was able to stop the great war that nearly destroyed the Human World centuries ago and begin the bright new Gourmet Age that would be based entirely around his philosophies on food. He was also the combo partner of the legendary "Chef Goddess", Froese. 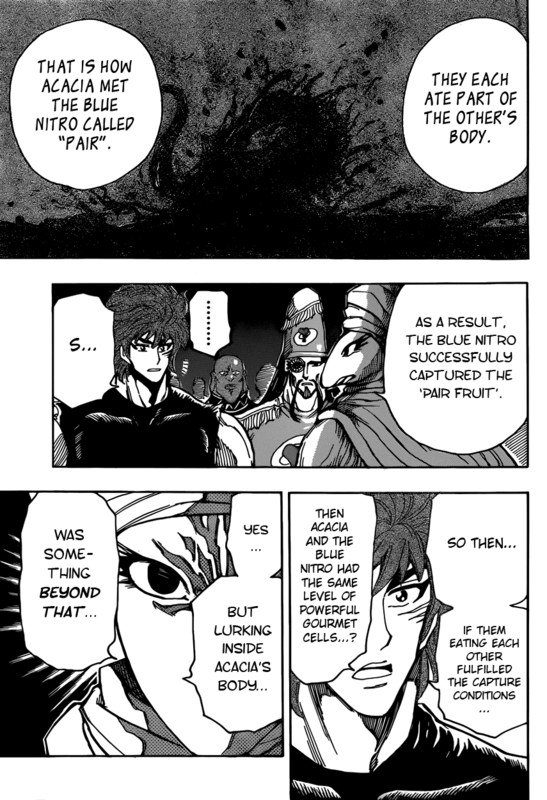 It is also revealed that he is the father of Toriko and Starjun. Acacia is later confirmed to have long been alive, having been dedicating his life to stopping Neo, his own monstrous Appetite Demon. 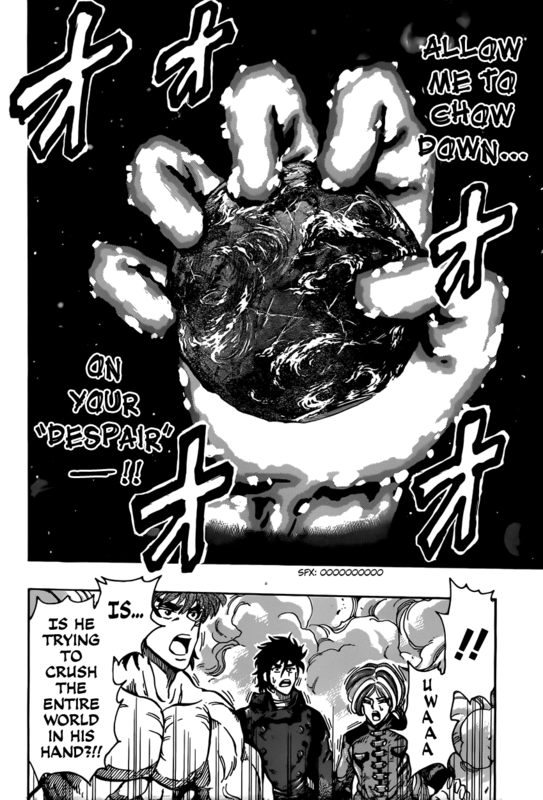 Being willing to become a demon himself to ensure that others would unite against him and destroy him for the sake of the world, with Acacia even sacrificing everything that he was for this cause, and was even ready to destroy what little was left of him and NEO to ensure the continued flow of gourmet energy through the universe. 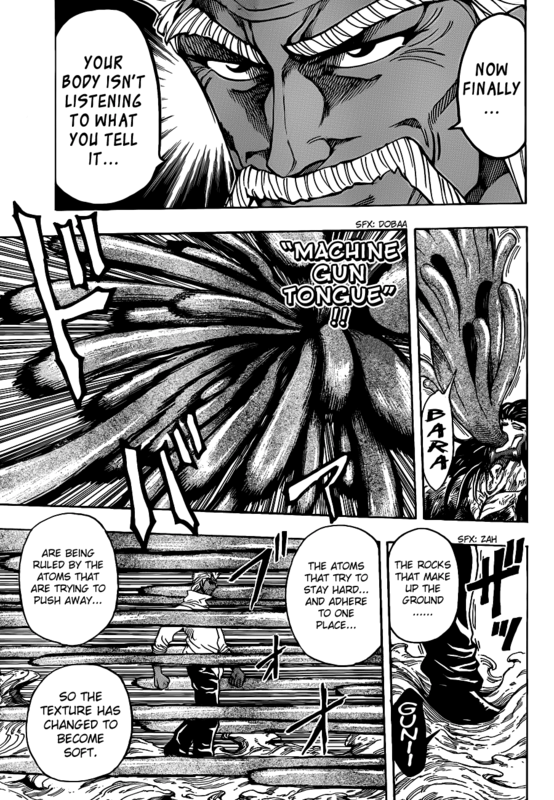 Powers and Abilities: Superhuman Physical Characteristics, Immortality (Types 1, 3 and 6), Appetite Energy Manipulation, Energy Projection, Transformation (Can shift between Neo and himself at times, can also change the shape of his mouth to consume a large being), Body Control, Limited Duplication (Can create small creatures from pieces of his body), Regeneration (High, Recovered from being reduced to scraps after the Deer King rapidly aged and starved him into submission to the point that his Appetite Energy was virtually gone), Can paralyse people with Knocking (Paralyzed Pair with a glance, taught Knocking to Jirou), Power Nullification and Sealing via Knocking (Sealed Jirou's power via Knocking), Energy Absorption (Can eat energy projection without needing his mouth. Can also eat them after having being hit by them), Biological Absorption (Acacia can eat life forms and gain their powers), Space-Time Manipulation via Back Channels (Can trap a person in a back channel and age them close to him by a month for every second that passes by, later after evolving he was able to freeze all of the eight kings in time), Teleportation with Back Channel (can go to different dimensions, even the World of Souls), Interdimensional and Inter-Universal Travel with Back Channel (Can travel to the World of Souls, came to Red Universe from Blue Universe), Reactive Evolution (Is triggered when somebody else uses time manipulation on him, evolved while countering Sky Deer's Back Channel), Power Absorption (Ate Midora, Toriko, and everybody else's Food Luck), Anti-Regeneration (On an atomic level with biting, as Midora was unable to regeneratehis arm using Minority World (Minority World works on an atomic level), and Starjun couldn't heal even if he ate compatible food), Anti-Resurrection (People eaten by Neo can't be revived), Possible Mind/Empathic Manipulation (Being eaten/bit by Acacia causes despair in his victims), Soul Manipulation (Ate Don Slime's spirit form, which is invisible and intangible), Existence Erasure (Can erase people and their soul by eating them; ate Don Slime's spirit form which is an invisible soul; also Food Spirits like Don Slime are intangible like Kaka), Healing and Self-Sustenance (Type 1, Ate AIR that allows him to heal himself incredibly fast and spend a few days in a place where there is no oxygen), Non-Physical Interaction (Drank PAIR that allows him to interact with Food Spirts and see Back Channels), Extrasensory Perception (Drank ATOM that allows him to see invisible Gourmet Matter), Resistance to Molecular Manipulation (Resisted Midora's Minority World and tanked Hungry Space, both of which work on an atomic level), Resistance to Poison, Absorption and Sound Manipulation (From Coco, Sunny and Zebra) Resistance to Electricity (Tanked and ate Don Slime's Black Thunder) and Fire Manipulation (Tanked and ate Starjun's Fire Spear), Resistance to Soul Manipulation (Resisted Guinness attempt to rip out his soul), Resistance to Mind and Death Manipulation (Resisted Emperor Crow's Shadow which makes the victim sink into madness, lose conciousness and cause death), Resistance to Spatial Manipulation (Survived and escaped from Moon's stomach, which is a literal Black Hole from which light can't escape), Resistance to Time Manipulation (Resisted Sky Deer's Back Channel with his own) and Time Stop (was able to movein the World of Souls despite the World of Souls having no flow of time, where concept of Space-Time doesn't exist, and anybody entering the World of Souls, even spirits, will lose their sense of time, distance or space), Resistance to Matter and Heat Manipulation. Intelligence: High, manipulated Froeze and the Blue Nitro in order to achieve his goals. As bishokushin he should have a vast knowledge about the Gourmet World. Very strategical and adaptive. He's also a highly skilled user in the use of knocking as he was the one that taught all he knew of it to Jirou and was also the one who sealed part of his full power away with it; he can even utilize it very well in combat, being able to apply it to strong beings like PAIR and even those like Midora without them noticing until the effects of the knocking kicks in. Weaknesses: None notable | As NEO, He can't stand The flavor of Anger, although this is still not clear how it will affect him. Autophagy (自食作用 (オートファジー) Ōtofajī): Autophagy occurs when living beings are starved and need energy, so their cells consume other less vital parts of their body. Acacia allows Neo to consume some of his body to restore his stamina; however, it is only a temporary solution. Knocking: Acacia was able to seal the enormity of Jirou's raw strength and gave him insight on "technique". This shows his capabilities of teaching is remarkable since Jiro went on to be known as "Knocking Master". It also leads to Jirou's undoing as Acacia knew Damage Knocking could be released. 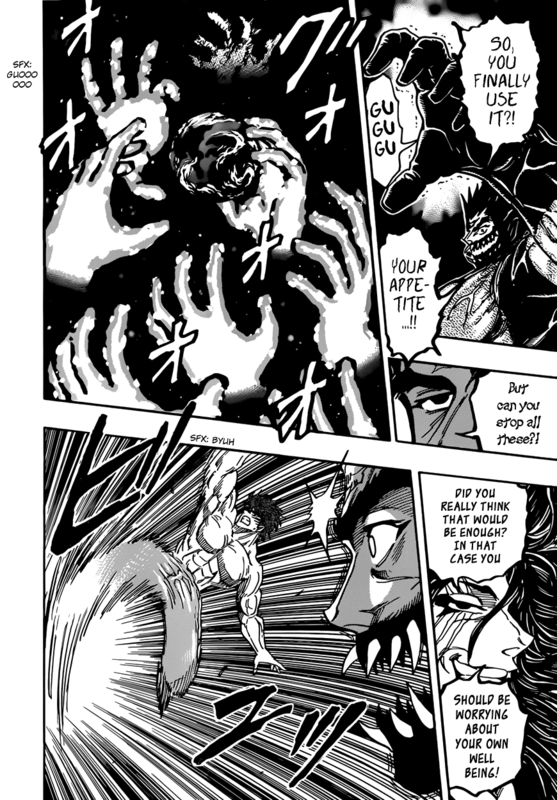 Acacia's skill and level with knocking should at the very least be comparable to if not superior to Jirou's, as he was able to stop the damage inflicted on Joa from Midora to prevent him from dying while also stunning him in place. His knocking was also shown to be powerful and fast, being able to apply it on a being as powerful as Midora without the latter noticing. Damage Knocking: Release: Acacia reaches inside an opponent and undoes any Damage Knocking, inflicting any accumulated damage all at once. Back Channel: Hard: Acacia traps his opponent in a Back Channel. His upmost limit on time compression is one second lasting one month. After using Neo's evolutionary abilities to revive themselves from death brought upon the Deer King's accelerated Back Channel, Acacia's Back Channel power has increased considerably, able to cover a large amount of area around himself to reach where the Eight Kings were from them and freeze them all in the moment of their attacks which span even less than a hundredth of a second. Appetite Energy: The cellular energy of the Gourmet Cells, which represent the "hunger" of the cells. Through training and mastery together with immense appetite, it can be brought outside the body in various shapes and forms. Heavy Rain: Feast of Kings (豪雨 王食晩餐 Gōu: Ō Shoku Bansan, Downpour: Meal Fit for a King): After consuming Neo, Acacia releases pure Appetite Energy up into the atmosphere. The energy forms countless meteor-like maws that then rain down. The damage they would have done had Midora not prevented it would have devoured the entire Earth. Gourmet Hand: Acacia creates a gigantic hand of his own Appetite Energy and strikes his opponent with it. An enormous hand print is left in the ground. Acacia can even enlarge his Gourmet Hand further to the point of grasping the entire Earth. He can also produce several more hands of planetary size at once. Gourmet Punch: Acacia launches a powerful punch, causing massive shockwaves. Gourmet Hammer: Acacia enlarges his arms, then clasps his hands over his head and slam them down on his opponent with great force. This move was powerful enough to crack and destroy Moon King's meteorite shell. Gourmet Spank: Acacia throws a gigantic hand of Appetite Energy, which leaves a continent-sized imprint on the planet. Gourmet Buffet: Conjures up and throws a series of appetite energy fists at the enemy. God's Grasp: Acacia can bring forth an absolutely gargantuan appetite hand underneath his opponents, where he then tries to crush them in it's grasp. Note: Acacia supposedly creating countless galaxies by spewing up food must be considered as a massive illogical outlier, as it completely contradicts the scale of every other feat shown in the series.